RVC emphasizes the joy of discovery: students are encouraged to follow their natural curiosity, and are given the space and tools to explore their interests. The RVC approach fosters independence and collaboration, individual responsibility and a caring sense of community. TK students join in Kindergarten/1st grade classrooms, but they follow a modified curriculum that is age- and developmentally-appropriate. 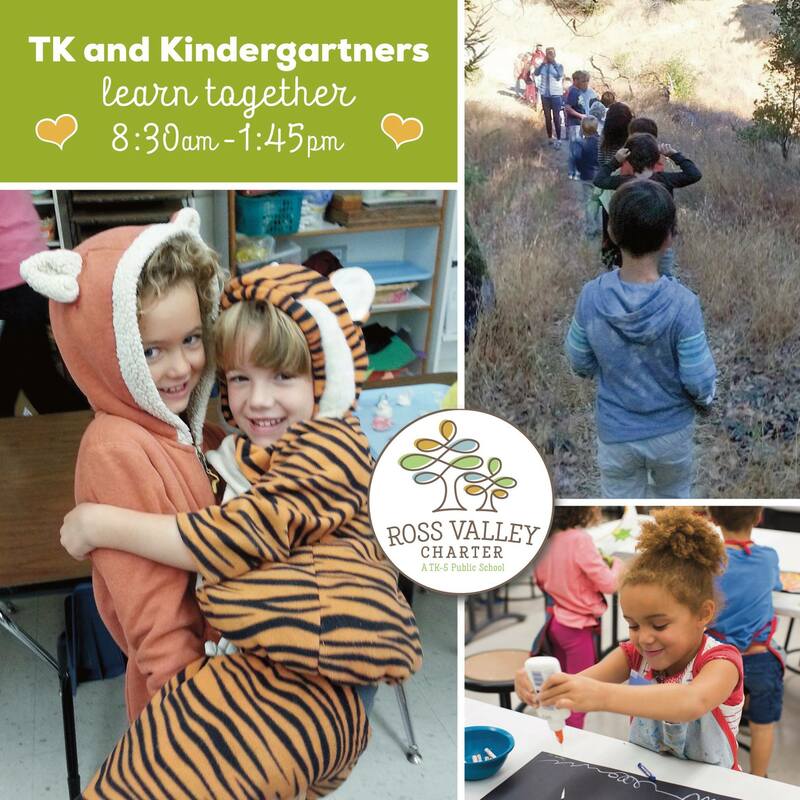 At Ross Valley Charter, Transitional Kindergarten fosters independence in our youngest students by providing a supportive atmosphere of play and creativity in the classroom. Students form friendships and take their first steps in academic learning by working with their Kindergarten and First Grade mentors. The curriculum is designed to accustom your child to a full day of learning and activity. Transitional Kindergarten follows the same daily structure as Kindergarten. Our TK students have an early release time with their Kindergarten peers of 1:45 every day. Students who start RVC in TK may either stay in one TK/K/1st grade class for three years, or complete one year in one class, and two years in a different class. Parents and teachers work together to decide what is best for each student individually. If you are interested in finding out more about our TK program, apply now or sign up for a tour. With a foundation of progressive student-driven learning, social-emotional development, academic rigor, and inspiring project-based education, Ross Valley Charter makes learning come alive for students. Our immersive, hands-on approach creates lifelong learners who act on their confidence, both inside and out of the classroom. Multi-age, inquiry-based education has a natural emphasis on collaboration and teamwork and helps create an environment of collaboration, mutual respect, and kindness. The projects that the students undertake require real applications of Common Core lessons, and result in performances, presentations, exhibitions, and academic reports that the students take great pride in sharing. Learn more about inquiry at RVC and find out about our whole-child approach to engaging our kids in their education.